For a more formal description of my work, I’m interested in understanding the physical mechanisms responsible for the highest energy emission in blazar jets. I use simultaneous, multiwavelength observations of blazars to constrain the location of the gamma-emitting region in flaring blazars. By constraining this region in flaring blazars, one can begin to isolate the dominant emission menchanisms responsible for what we observe. This was the main subject of my dissertation work, some of which can be found here and here. 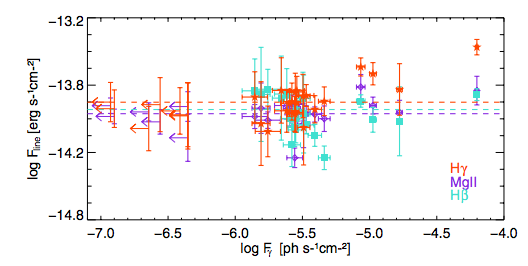 The following plot summarizes the results of those studies, namely that at high gamma-ray flares, there is an increase in the broad line luminosity, which suggests that for those flaring episodes, the gamma-emitting region is within the broad line region.